If you’re looking for an excellent beginners guitar, and are ready to shell out a couple or more of Benjamins, you needn’t go further than the Yamaha APX500III Thinline Acoustic Electric Cutaway Guitar. Ever since its inception way back in the nineteenth century, Yamaha has focused on musical instruments, and over time, has built up a reputation of being especially suited for beginners due to the excellent value-to-money ratio. Moreover, enjoy peace of mind with Yamaha’s limited lifetime warranty on the top, neck, body and sides. The Yamaha APX500III sports the classic dreadnought shape with a single Venetian-style cutaway for easier access to the higher frets. It’s a spruce/nato/rosewood combo, bringing out the best of the three worlds. The centerpiece, so to speak, is the spruce top, which gives a great deal of clarity, so it’s favored by players whose style requires a wide dynamic response and a booming, weighty tone. This is nicely complemented by the nato body, which resembles mahogany in almost every respect. Nato serves to mellow out the sharpness of the spruce top. Additionally, the non-scalloped X-bracing serves not only to provide support to the top, but also to maximize body resonance to achieve full natural tone. The nato/rosewood combination of the neck and fingerboard, respectively, adds complexity to the highs, while thickening the lows and just the right amount of punch and honk to the mid-range. As the company justifiably points out, the APX500III BL Thinline Acoustic-Electric embodies the true spirit of Yamaha – quality, reliability and affordability. However, this is nothing without some style to attract the buyer in the first place, now is it? The APX is available in a variety of finishes – the monochromatic Black, classic Natural, as well as multicolored Oriental Blue Burst, Dusk Sun Red and an all-time favorite – Vintage Burst. Action is pretty fast, with the strings lying very low, although there is no buzz or dead frets. The rosewood fretboard feels very finished, frets are well-dressed, and the default strings are not too shabby, although you might consider a replacement. 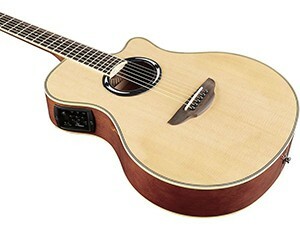 This is a great axe if you want to go acoustic, but also dabble into electric from time to time. Unplugged, the guitar delivers breezy, balanced highs, bright and clear mids, as well as tight lows. It lends itself perfectly for fingerpicking, though strumming makes it sound somewhat hollow and thin. On the other hand, the top-notch Yamaha electronics make the APX sound articulate and full thanks in no small part to the under-saddle piezo pickup with 3-band equalizer (two shelving bands for bass and treble, as well as a peaking band for midrange), adjustable mid-range frequency control, and an in-built precision chromatic tuner. It has a great bass, on account of its dreadnought body.